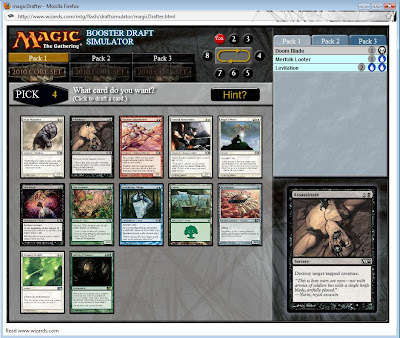 I took some time today to play with the draft viewer over at the daily MTG today. Their draft simulators are always fun for a brain teaser. Today they were offering M10. Here is what I ended up drafting. The first pack offers a number of really good choices. Overrun is a bomb. Dragon Whelp and Inferno Elemental are both very strong as well. I like Doom Blade here though. 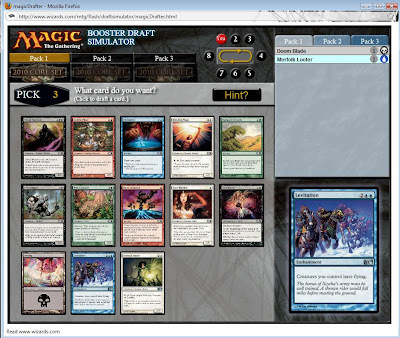 It is a powerful card, a typical first pick, and it doesn't commit me strongly to any colors. This pack is pretty horrific. There is nothing obvious to take for black so I now have to delve already into a second color. Options are limited here. I consider the Oakenform but then debate between the Merfolk Looter and Snapping Drake. I end up going with the looter. It's not really a "creature" but it's ability is very powerful. Pack 3 has several options. I can take a couple of black creatures that are solid but not amazing or I can take Levitation. 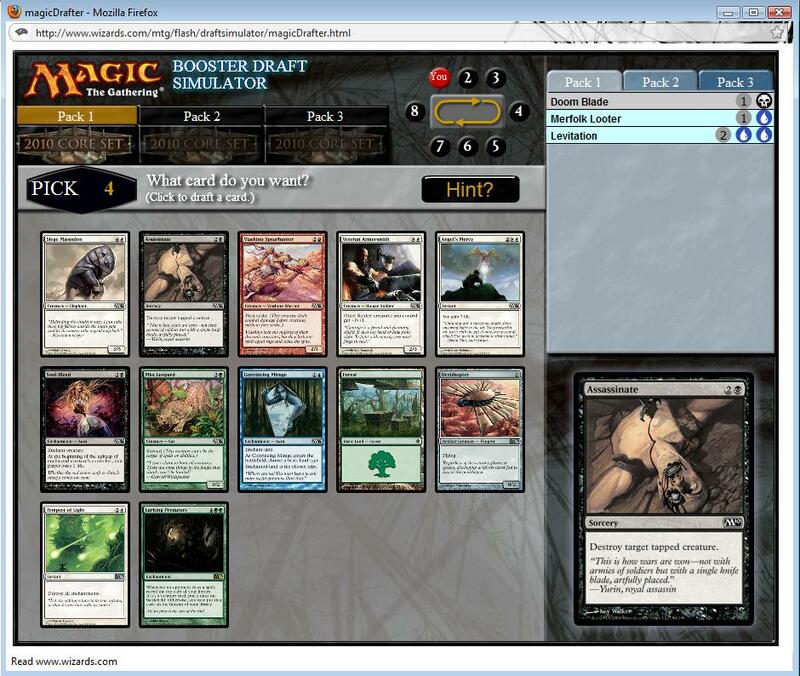 It's a bomb when used with correct creatures but taking it now is a bit early. I consider gravedigger but end up committing to blue here with Levitation. The next pack offers little options. Blue has dried up. My options are Assassinate or the bizarre rare: Lurking Predators. I take Assassinate. Wait what? What happened to blue/black? It blows. I have a Zombie Goliath and a sideboard card in black and now blue is completely cutoff. I decide to jump at the Ranger for two reasons. 1) It establishes me in green and 2) It still lets me salvage my earlier picks. The remaining picks from the first round are mediocre but useable. Oakenform and Giant Growth are solid picks. I grab a Rampant Growth to further color fix and accelerate. Horned Turtle is the best creature I come up with. I really need to start grabbing creatures in the later packs. This wasn't terribly difficult since I had already started drafting green. The Behemoth can just win games when it hits the table. I scoop it up and don't look back. I'm now playing green no matter what. I grab additional creature enhancements with another Oakenform and a Gorgon's Flail. I also start grabbing creatures: Giant Spider, Craw Wurm, Llanowar Elves, Borderland Ranger. I'm still kinda light, especially if I plan on running double oakenform. I really need to focus on creatures in pack 3. I've got another Doom Blade staring me in the face. There is also a Pacifism. I am in dire need of creatures though. I think about either the Acidic Slime or the Stampeding Rhino and eventually take the slime. 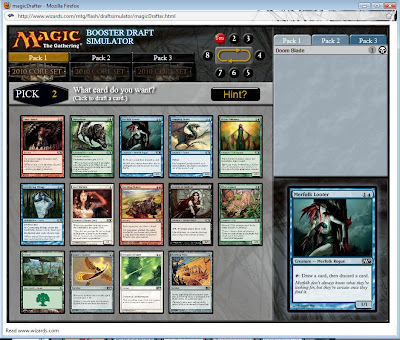 I end up picking up 6 more usable creatures including a Stampeding Rhino and an Alluring Siren. I also snag a third pick overrun. Despite missing it way pack in pack 1 it still ends up in my draft, and my deck. So this was a pretty sloppy draft. I end up going green but don't do that until the fifth pick. Fortunately I'm able to use all of my early picks because everything is so easily splashable. I have a number of bomb creatures and a lot of enhancements. It's not a great deck, but I don't think it's bad either. That's 10 spells and 15 creatures. 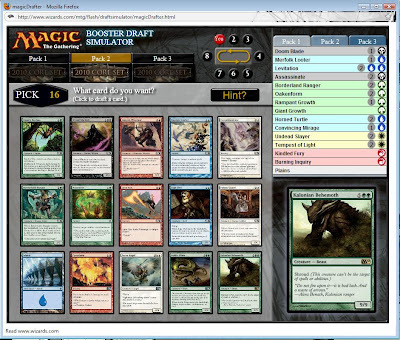 Only 15 land and yes, 3 colors, although really this deck is basically mono-green with some blue and black spells. I'm able to cheat a bit on the land because I have double Borderland Ranger, double Rampant Growth and a Llanowar Elves. I don't think I'll have a problem ramping up to the big creatures and finding my swamp should be no problem at all. I also have a number of small utility creatures that can become monsters late game with Oakenform and Overrun. I'm concerned I might be removal light but I think Doom Blade and Assassinate can do the job if necessary. I also like alluring siren as a secondary removal spell. At the end I may not need removal at all. 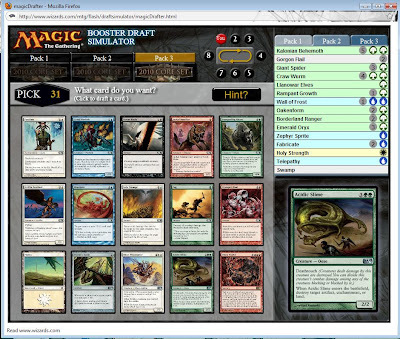 Flying Craw Wurms and 7/7 Stampeding Rhino's tend to win games no matter what my opponent puts on the table. 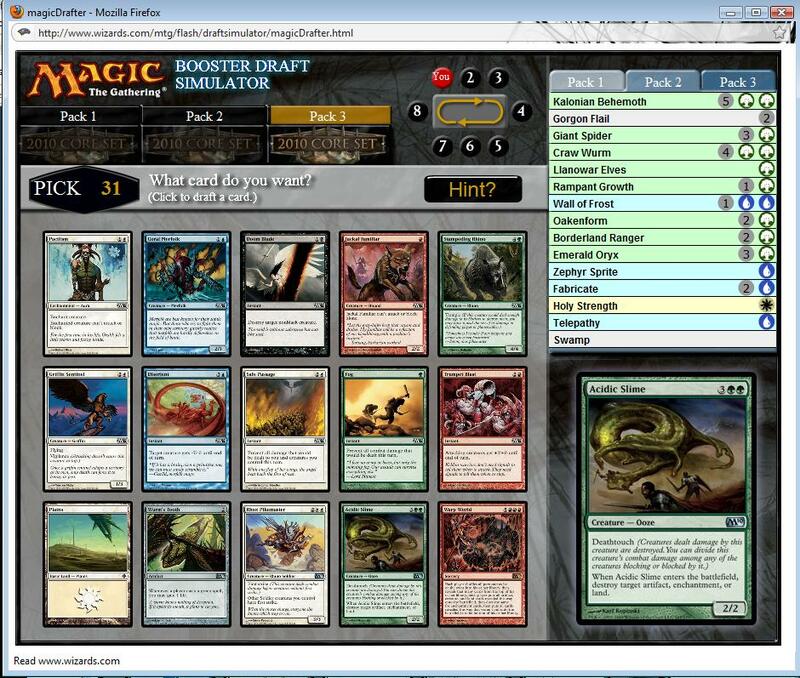 Did you try this draft? Did you fare better than I? 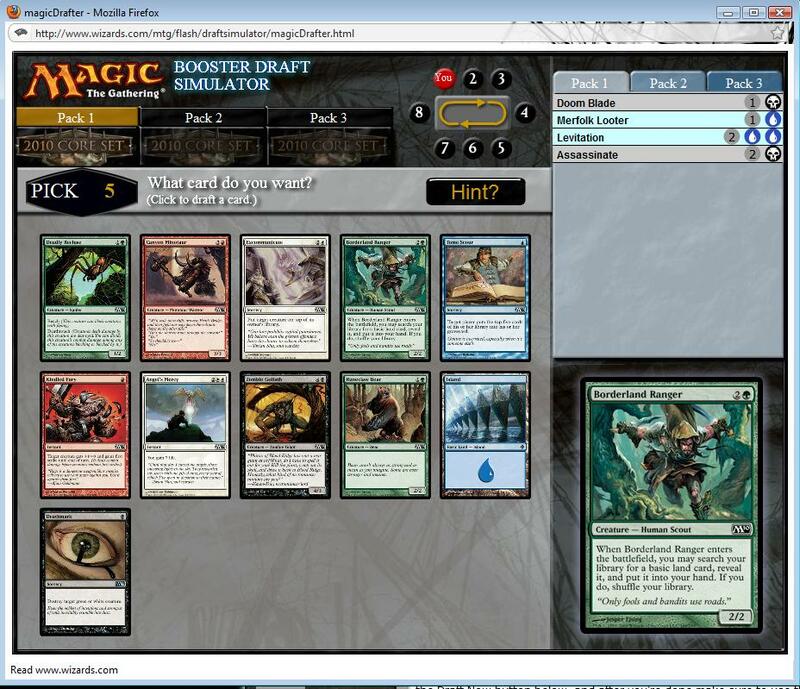 I'm wondering if taking a 3rd pick gravedigger could have changed my draft for the better. 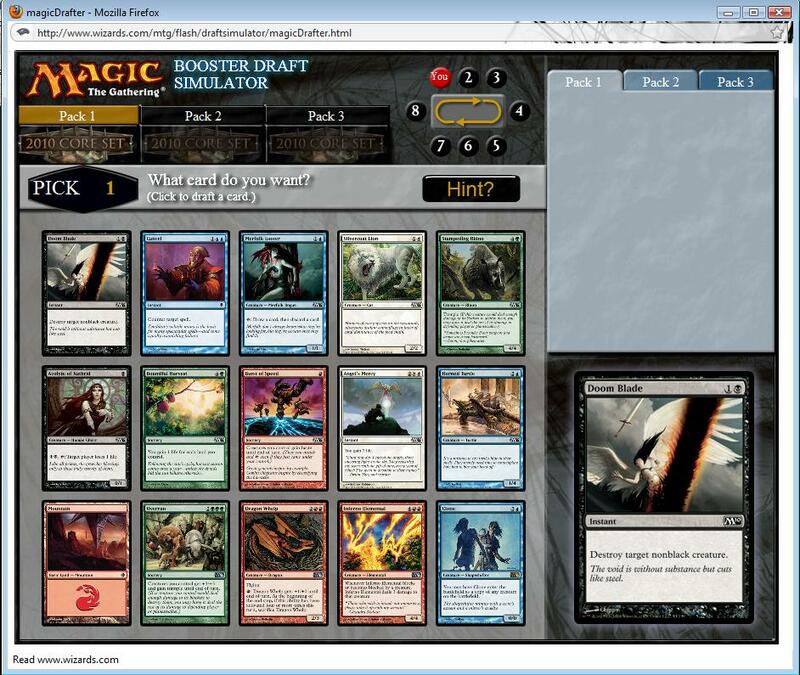 0 Response to "Draft: M10 Draft at the Daily MTG Draft Viewer"